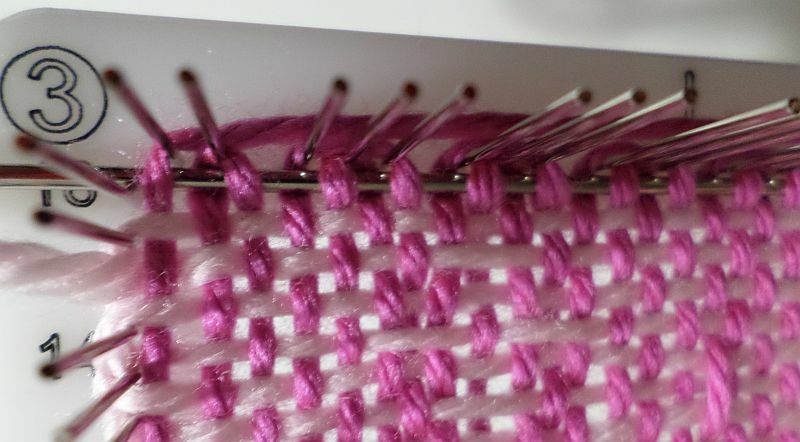 On the pin loom, I recommend using slightly thicker yarn such as Red Heart Soft. In the sample I used Bernat Satin which is thicker than Caron Simply Soft and Yarn Bee Soft Secret, but it still didn’t seem full enough to me. 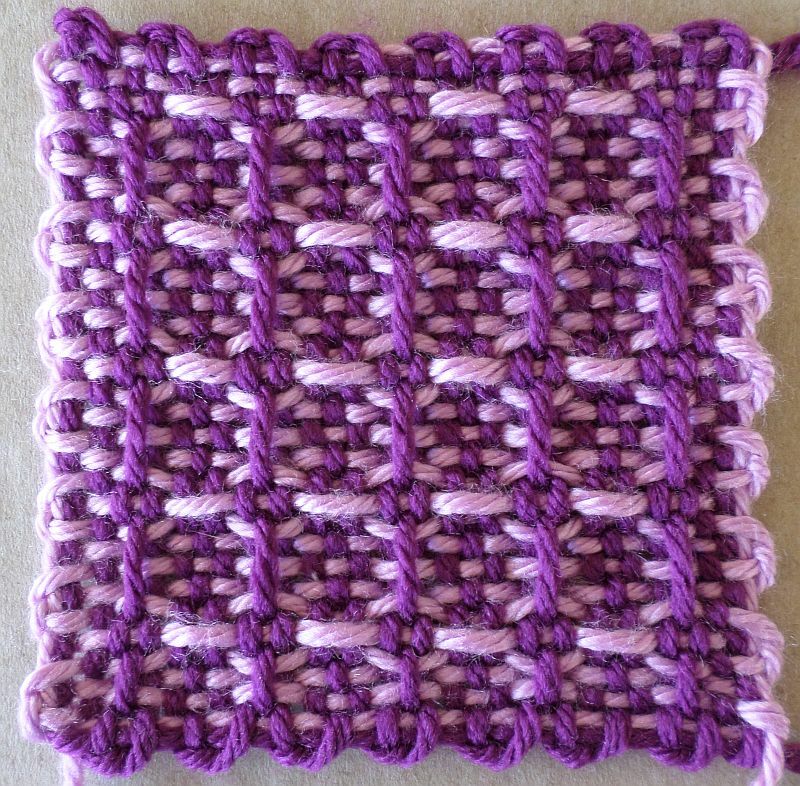 There’s no photo of the completed pink square because I didn’t like the result. Because I don’t use this one very often, and don’t get much practice with it, these instructions are subject to slight changes. For now, here they are. I thought about taking a photo of this, but didn’t: tie on L1 near Cr2 using a reverse slip knot (RSK). Begin warping L1. While warping L1 you’ll need to lift the RSK off the pin you tied it to. 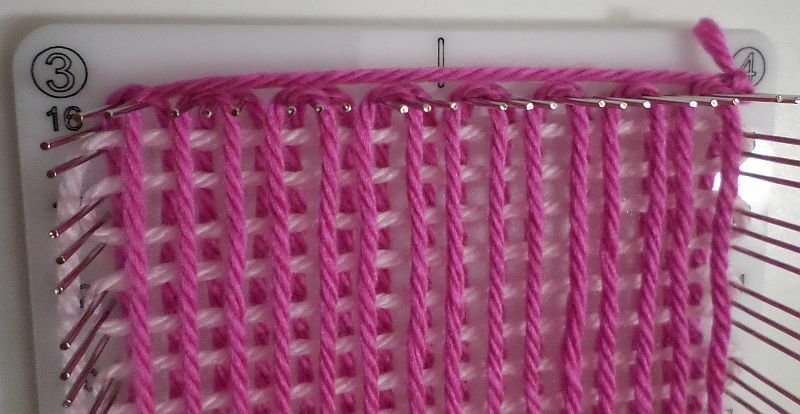 After L1 is warped, leave the yarn still attached to the skein hanging there at Cr2. Using color 2, tie on, with RSK, near Cr1. Take yarn outside pins up near Cr3. 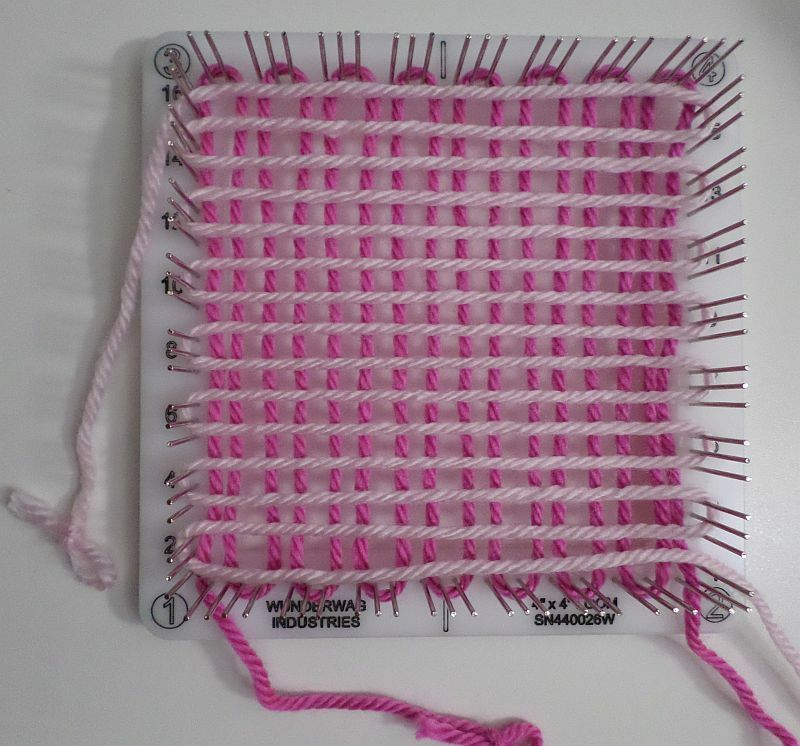 Thread it through the last two pins of the 1-3 side of the loom (see photo below for a close-up). At the end of L2 you can measure the warp now or leave it attached to the skein and measure off later—it doesn’t matter. I usually measure the weft at this point, but didn’t today. 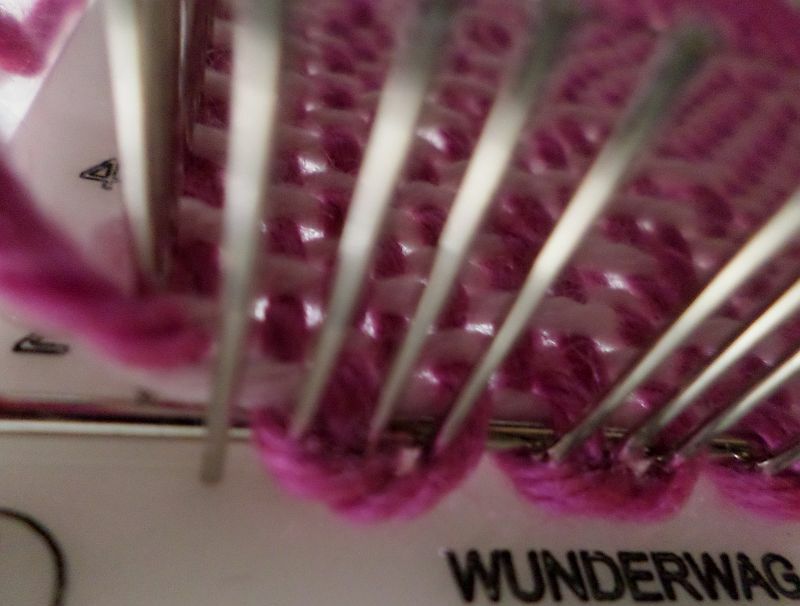 Before warping L3, lift RSKs from the pins so they don’t get trapped beneath L3 warps. L3-backward ends at Cr3. 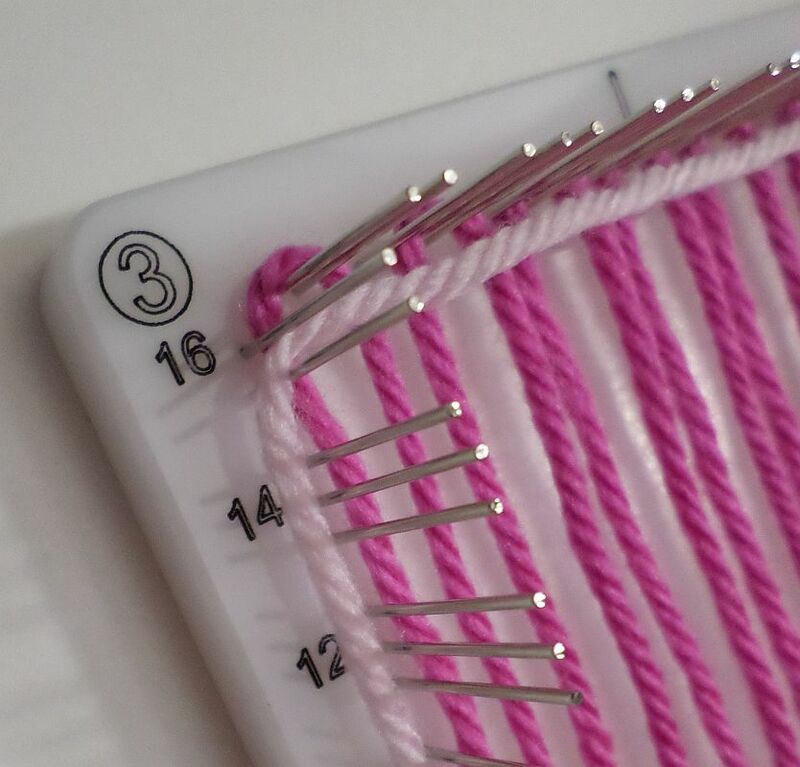 Take yarn tail above 3-4 side pins, tie off at Cr4. See close-ups below. Perhaps not necessary, but sometimes a close-up can make things a little clearer. I tied off L3 on the furthest Cr4 pin. Replace the L2 and L1 RSKs. I found it helpful to have L1 on top of L2’s RSK. 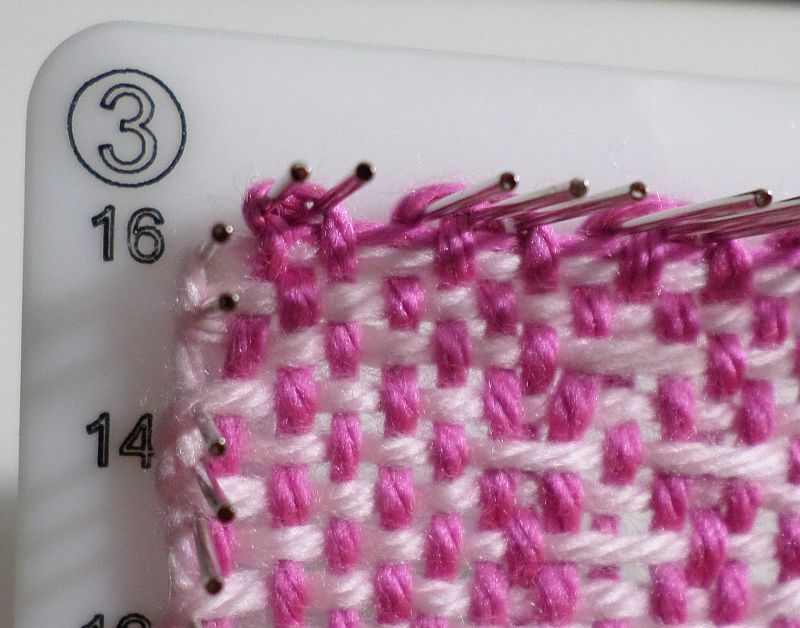 If you haven’t done so yet, measure warp, cut, and thread needle. 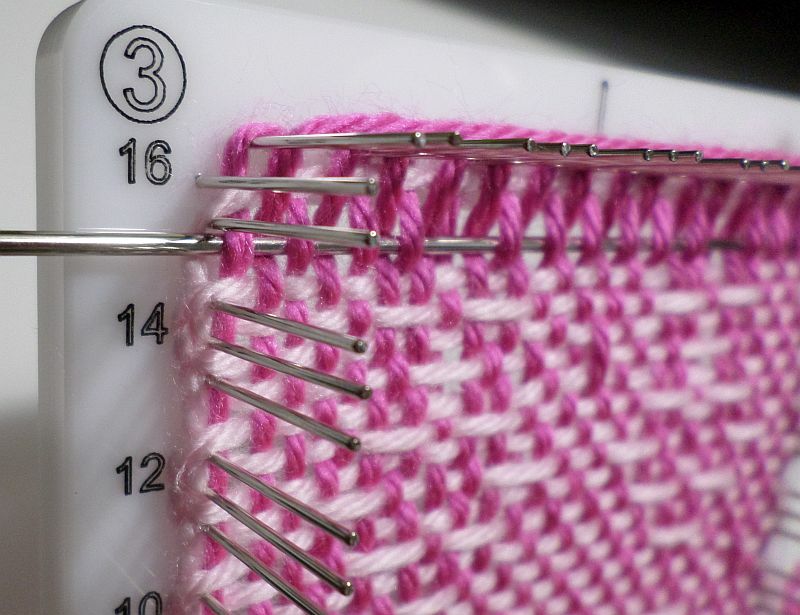 This post assumes you’ve acquired the basics of working in ends as you weave (see series part 1 post). Begin weaving UNDER the first L1 warp at Cr2. At the end of R1, take the needle UNDER last warp, OVER the L2 tail (though I don’t think it matters if you go over it or under it). Yes, the idea is to minimize the number of tails to be worked in, but with two colors there will always be extra tails, especially when working two colors on two different layers. You have the option to leave any, all, or none of them out for sewing purposes. 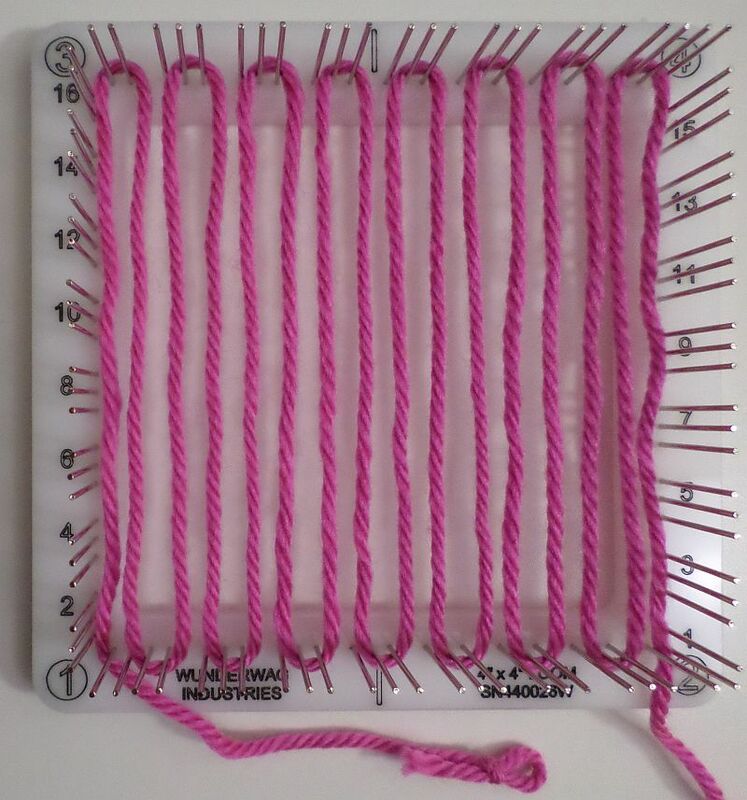 In this warping configuration you will only be working in one tail (L2 beginning) as you go, the other three will be dealt with while the square is still on the loom. 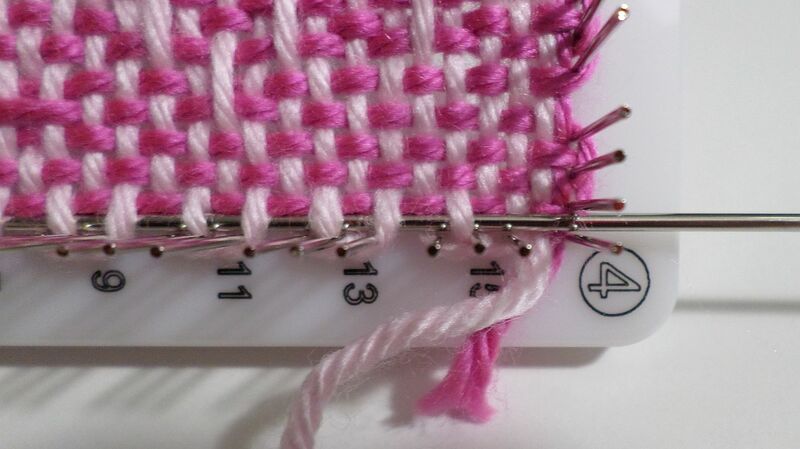 The L1 beginning tail can be worked in at any time while you’re weaving the square. L3 and L4 ending tails will be woven in after the square is finished but still on the loom. 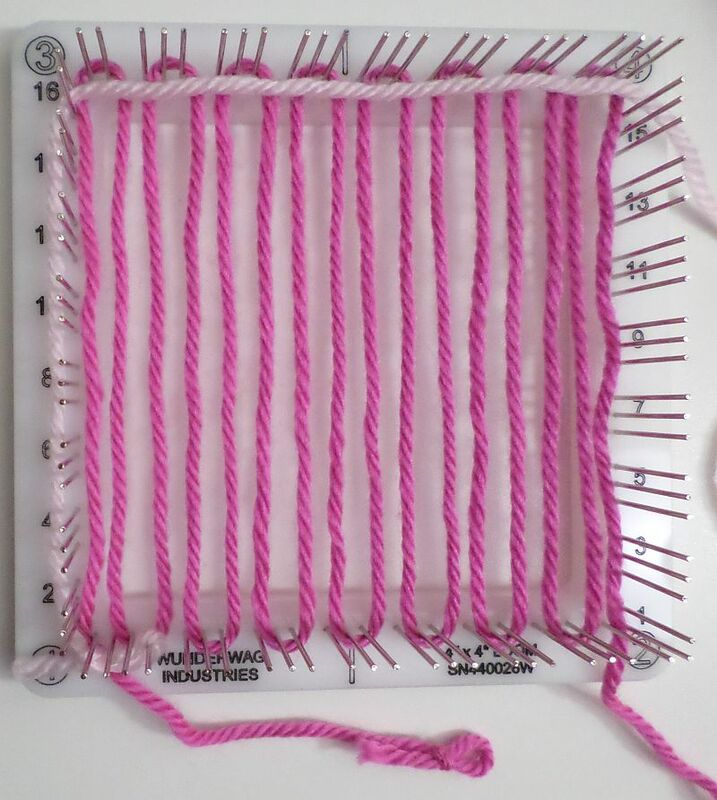 At Cr1 take needle UNDER the first three warps. Follow the R1 path. You can leave the L2 tail out or in as you pull the L1 row through. This is really difficult to show in a photo. If I ever make changes to this method, this is where I’ll make them. L1 tail worked in along R1. Try to keep the tail below the original R1 since it’s a different color. R15: Exit UNDER last warp, OVER outer tail. 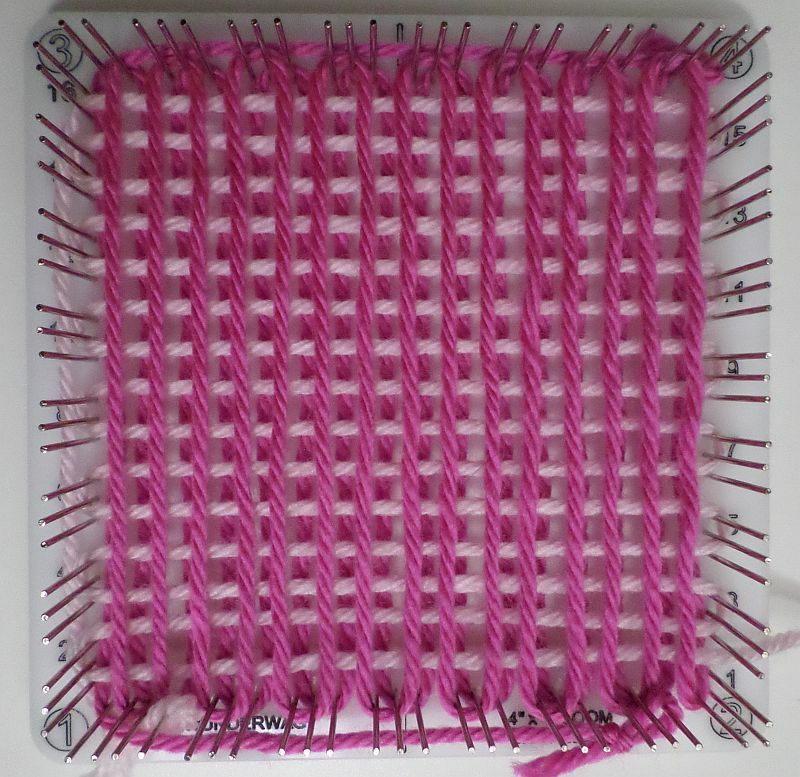 R16: There’s no outer loop, so just go UNDER the first warp. L3 tail goes UNDER the warp and across in exact imitation of R16. Close-up of L3 tail worked in at Cr3. You might not want to pull it quite so tight. All Horizontal Xs variations look good in this warping configuration.